By design and for security reasons, Windows 8 and Windows 7 don't allow users (even Administrators) to save files in the root folder of drive C:\. So when the user tries to create a file in the root drive C:\ (using notepad or another program), he receives a "You don't have permission to save in this location" error message. 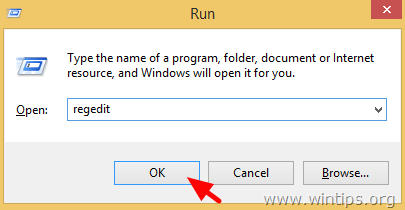 In Windows 7 OS the only action you have to perform in order to save files at this location (C:\) is to Turn Off UAC (User Account Control) settings from the control panel, but in Windows 8 OS (or Windows 8.1) this procedure doesn't work any more and you have to disable the UAC through Windows Registry. Keep in mind that disabling UAC on your system is not a secure practice because it may allow malware programs to compromise your system. In my opinion and according to my experience, "UAC" is a little annoying security precaution because you always have to answer to a recurring popup window for almost any action you want to perform to your computer. 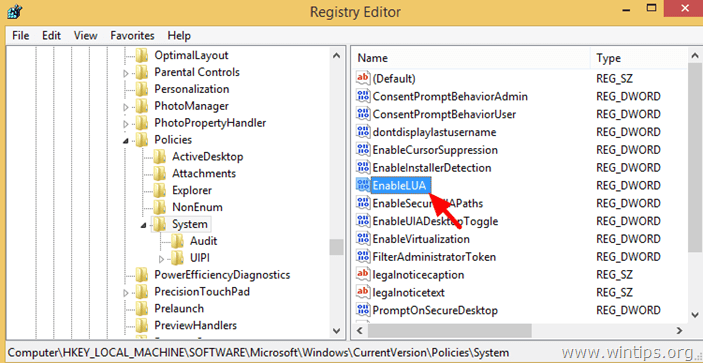 How to Disable UAC in Windows 8.1, Windows 8, Windows 7 and Windows Vista through Windows Registry. 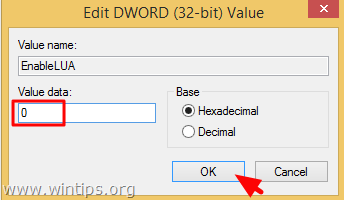 Note: If you to modify User Account Control (UAC) sensitivity level then read this tutorial. 2. Type “regedit” and press Enter. a. From main menu go to File & select Export. 4. At the right pane double click at EnableLUA DWORD value. * Note: Set the value to 1 (one) anytime you want to re-Enable UAC on Windows. 6. Close Registry editor and restart your computer. « Fix Powershell has stopped working problem – Poweliks Virus Removal Guide (Solved)	» How to Clean Boot Windows 10, 8, 7 or Vista.